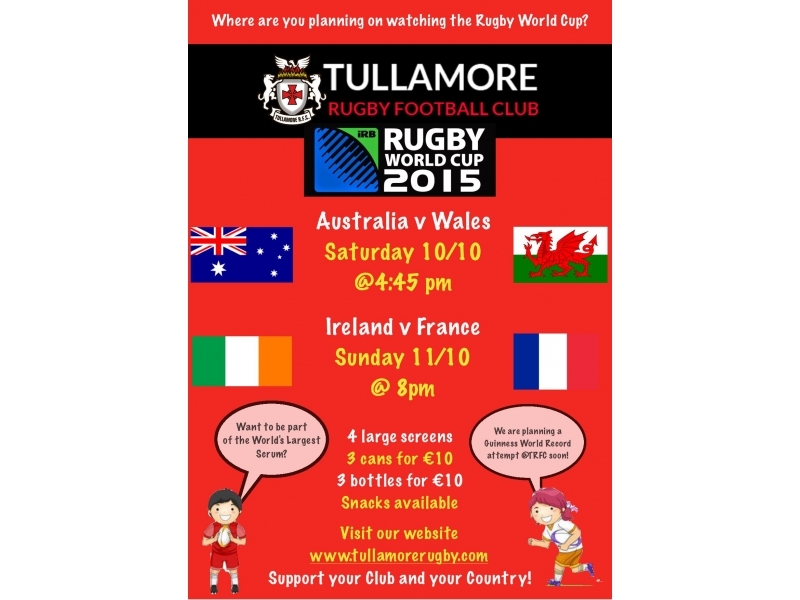 The Rugby World Cup comes to Tullamore with a bang on Sunday 27th September . R.T.E.Radio 1 bring their Sunday Sports Programme to Tullamore Rugby Club. The programme will be broadcast live from Spollanstown from 2pm to 7pm with special guests former Internationals Marcus Horan and Victor Costello. The World Cup matches will be shown live on 4 big screens in the ClubThe big game from our perspective Ireland V Romania kicks off from Wembley at 4.45 pm. Admission to the Club for the day is free to men, women and children from anywhere in the country. What an incredible atmosphere we should have so make sure you are one of the lucky ones to have a ringside seat. 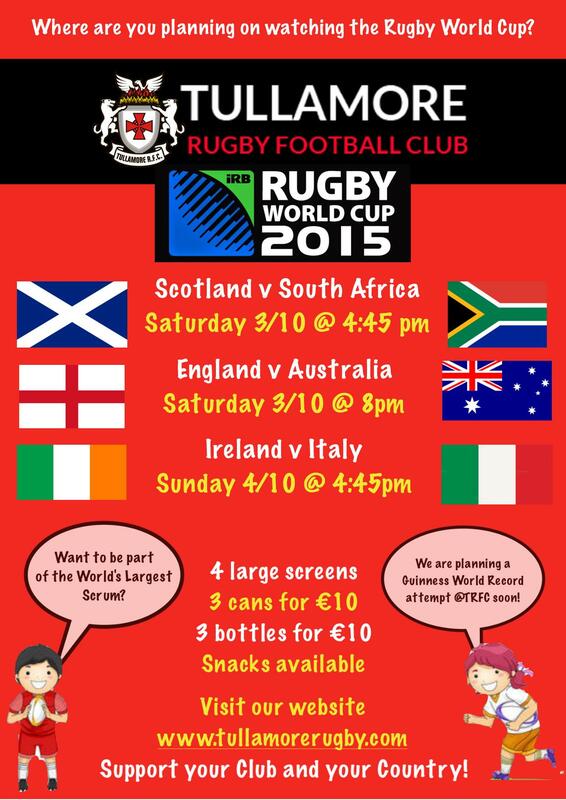 There will be food and drink available , special world Cup mementos and plenty of entertainment for all. 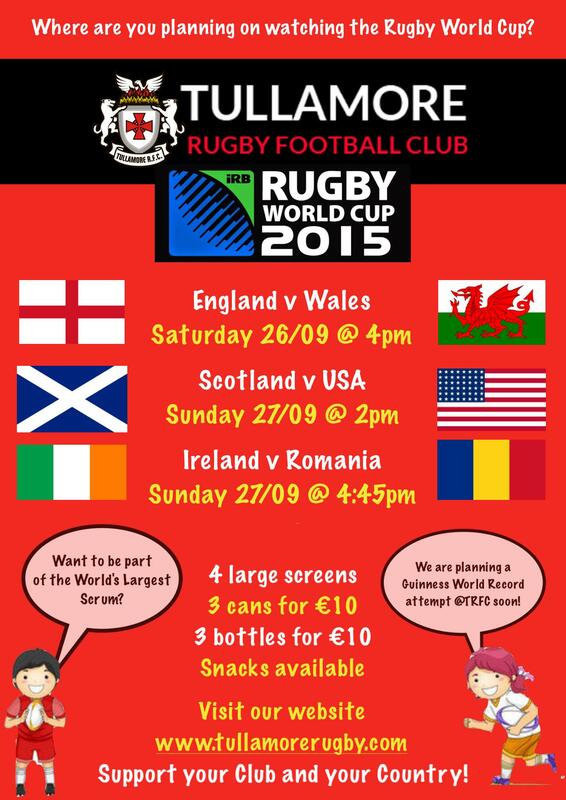 Ther will be a special Guess the score competition for the Ireland V Romania game with some terrific prizes. Guests are former Ireland Number 8 Victor Costello who won 39 caps for his country and Marcus Horan who won 67 caps as a prop. 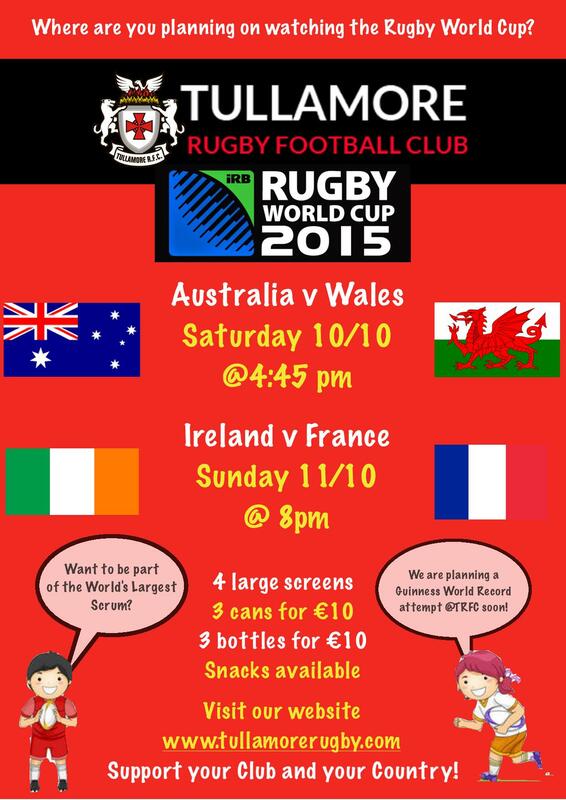 Sat Oct 10th Australia V Wales as well as all of Ireland,s matches. There will be snacks available and special drinks promotions. All Quarter Finals, Semi Finals and the Final will be shown on 4 big screens. The excitement reaches a climax on Oct 31st, World Cup Final day in Twickenham. Tullamore are looking for volunteers on that day to attempt to enter the Guinness Book of Records . The main pitch will be used to form the largest scrum in the world. You dont need to be a Rugby player to join the scrum. 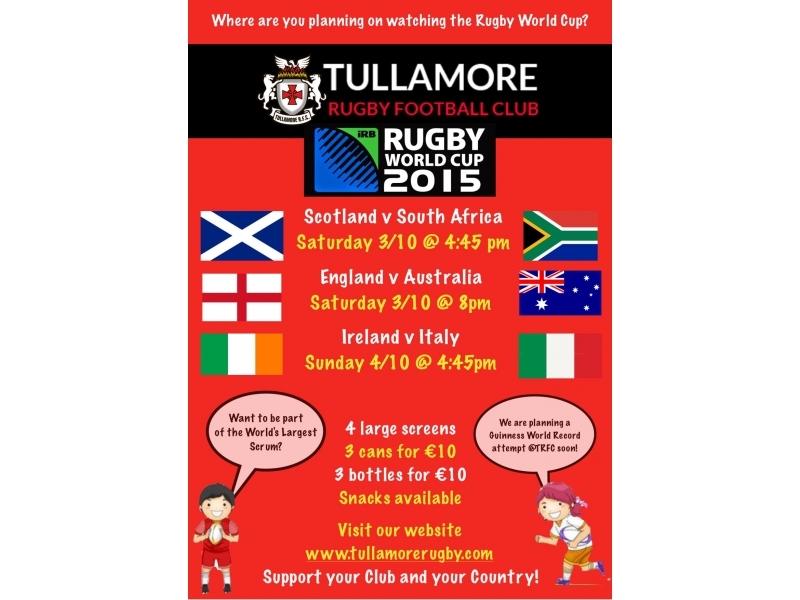 Throughout the World Cup Tullamore Rugby Club will be the Mecca for all sports followers. You dont need to be a Rugby player or fan . There will be something for everyone from 8 to 80, male or female. Watch out for posters advertising the main events. 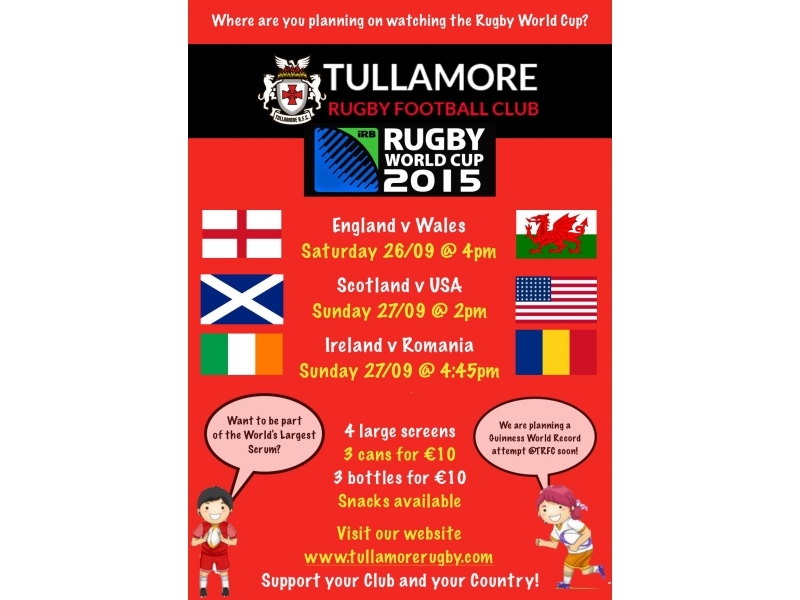 Check out the Rugby Club Website Tullamorerugby.com ,Facebook Tullamore rugby club and Twitter @Tullamore R.F.C.